The fourth course in the Foundational curriculum provides care managers with skills for obtaining more comprehensive and clear information about the clients they work with on a daily basis. In order to “Get the Whole Picture” care managers must have enhanced skills at dissecting information, probing for more detail, and evaluating external factors. Join the Interest List for this Course! The course focuses on trauma informed care practices, evaluating meaning in communication and documentation, skills for assessing capacity and literacy, and understanding mandatory reporting protocols. In addition, the course includes modules on psychosocial aspects of care, managing multiple chronic conditions, working with special populations, and completing effective home visits. Each module within the course can be taken separately. 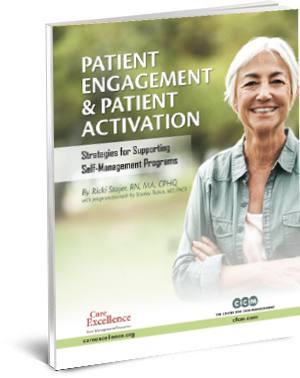 This eBook examines the evidence base surrounding patient engagement that leads to effective self-management, models that enhance patient activation, and more. The Getting the Whole Picture course has been pre-approved by the Commission for Case Manager Certification (CCMC) to provide 19.5 hours continuing education credit to Certified Case Managers (CCMs). All of the case management education offered through Care Excellence have been designed to give you exactly what you need, when you need it. Feel free to take the entire Getting the Whole Picture course for a broader understanding or laser focus your training on any combination of the modules below to address specific challenges. Please call us if you want to purchase multiple modules or if you need assistance designing a custom combination of solutions. Trauma Informed Care is a treatment framework for working with individuals, who have experienced events, or periods of events, of physically or emotional trauma, which impact physical, emotional, mental, and spiritual well-being. Care Managers will learn how to become trauma-informed in their practice by learning how to recognize the effects and complex issues of trauma, how to look for patterns of utilization related to trauma responses, and how trauma impacts health problems, influences social outcomes, and increased cost to social services. Most importantly, care managers will learn how to build a trauma-aware workforce focused on supporting and understanding people who have been traumatized while avoiding unintentional re-traumatization to the individuals they serve. Communication and documentation are critical for effective care management; however, meaning can sometimes be elusive, misunderstood or not interpreted clearly. Care managers will learn how to effectively understand and interpret communication in written, verbal, and non-verbal form. Additionally, care managers will learn skills for enhancing meaningful communication in all settings with clients and other professionals to improve every day interactions, creating healthy forums for problem solving, and engaging in robust collaboration. Care Managers have the responsibility to determine a client’s ability to consent to services. It is not always easy to determine if a person has issues with capacity or literacy. This module will prepare care managers for understanding the differences between capacity and literacy, determining when a client has capacity concerns versus literacy issue, and how to address the situation once a determination has been reached. Care Managers are obligated reporters; however, it is not always clear when reporting is required. In this module, care managers will learn how to effectively evaluate situations based on mandatory reporting protocols to protect clients, while simultaneously preserving professional integrity. This module also details who or what populations should be covered under mandatory reporting; and when reporting is not mandatory due to privileged information versus when reporting is mandatory based on professional responsibility. Successful care management requires that care managers understand clients holistically. This means care managers should have a clear understanding of the psychosocial aspects that impact the client’s life. Care managers will learn how to effectively evaluate the environmental factors that impact clients, how to work collaboratively with support systems, and how to assess risk factors and implement interventions for minimizing impact. Clients in care management often have complex and multiple chronic conditions. In this module care managers will learn about multiple chronic conditions, how to assess clients successfully when multiple chronic conditions are presented, how to evaluate functional status and performance in a multiple chronic condition setting, and how to manage and coordinate care for these individuals. This module also details how care managers can effectively manage multiple care providers within a multiple chronic condition care dynamic. Clients in care management have unique and individualistic needs, and sometimes these special need are related to how a client lives, where a client lives, age, accidents, illness, genetics, or other distinctive factors. In this module, care managers will receive an overview of special populations to enhance their understanding of clients’ distinct needs. The populations reviewed will include: People with Mental Illness, Homelessness and Poverty, Substance Use, Pain Management & Chronic Opioid Use, Domestic Violence, Jail and Forensic Health, People with Physical Disabilities, People with Intellectual and Developmental Disabilities, People from the LGBTQ community, Alzheimer’s/Dementia, Traumatic Brain Injury (TBI), Transplant, Pregnancy, and Pediatrics. Care management is most effective when a client is evaluated in his/her own setting; therefore, in complex situations, care managers are required to complete home visits. This module details how to skillfully complete a home visit including: how to safely and positively interact with the client at home, how to comprehensively evaluate the living space of the client, how to interact with and engage the support system in care planning, and how to evaluate the community and environmental factors present in the space where the client resides. The Getting the Whole Picture course is available online and can be purchased both in its entirety or piecemeal by modules. Please call us for more information.